VaCAP has been following the Clarocity Corporation Soap Opera since one of our members had trouble getting paid from them back in November of 2017. After doing a bit more research on them, we issued a warning to our members in December 2017 to pay attention as Clarocity was in financial trouble. We kept watching and alerted our members many of the AppraisalLoft Executives were now at Clarocity. We shared Clarocity was borrowing money at a bought down rate of 24% and repaying in stock shares in lieu of cash; all to cover daily operating expenses. AppraisersBlogs shared an article in August of 2018 when Clarocity stock hovered around a penny per share. Our last warning was in February 2019 when Clarocity used the excuse of the “Government Shut Down” as to why appraisers were going unpaid. Clarocity defaulted on their $20,000,000 plus debt to StableView in January 2019. On April 2, 2019 the main investor of Clarocity, StableView Assets directed the Trustee to “seize the shares” of Clarocity Corporation for repayment of their debt. 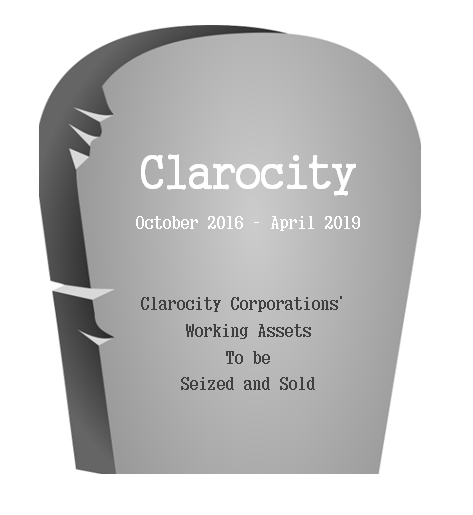 Well here is where it gets a bit interesting, The assets, are actually the subsidiary companies of Clarocity, which includes the Appraisal Management Company, Clarocity Valuation Services, formerly known as Valued Veterans. Ok, so what will happen to Clarocity Valuation Services? Once under the ownership of StableView Assets, they will be sold to I Look About. Read about that agreement here. Why StableView and I Look About think there is value in an appraisal management company or the hybrid appraisal software they promote, is a question for another day. Clarocity is insolvent, Clarocity Valuation Services is being foreclosed on and sold to I Look About. Where does that leave the appraiser? Who is responsible for paying the appraiser? Will these companies strip the cash and assests? Is there money to pay the appraiser? Are any of the soon to be owners obligated under law to pay the appraiser? Thank You for Being Part of VaCAP!